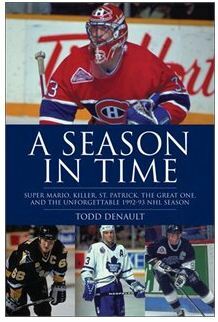 Todd Denault is back with his third book release. A Season in Time: Super Mario, Killer, St. Patrick, the Great One, and the Unforgettable 1992-93 NHL Season is a celebration of the twentieth anniversary of one of the greatest seasons in hockey history. And congratulations are in order, as the book as made Chapters' bestsellers list. For many hockey fans, the mere mention of the 1992-93 season and the playoffs that followed elicit both powerful and still-vivid memories, more so than any other NHL season in recent memory. Two decades later that extraordinary season is fondly remembered as the year that Mario Lemieux, the sport's most dominant player, courageously conquered his greatest opponent yet—cancer—and still emerged as the NHL's Most Valuable Player. Not only did he become the best player in hockey, but he transcended his sport with his courageous battle. Then there was Wayne Gretzky, the greatest player in hockey history, He began the 1992-93 season began on the sidelines, his unparalleled career in doubt with chronic back problems. But he battled back and with all his skills and prowess he took Hollywood on an amazing trip for one last glorious run at the Stanley Cup. The next great player arrived to great fanfare and amidst great controversy. Eric Lindros, the undeniable Next One, made many enemies in his time, made quite an impression on and off the ice. Meanwhile Steve Yzerman, Joe Sakic, Teemu Selanne and Pavel Bure represented the next generation brilliantly. 1992-93 also represented a rebirth of the Toronto Maple Leafs, thanks to a determined Doug Gilmour and coach Pat Burns. The Leafs took their long-suffering fans to the verge of the unthinkable. And then there was the Montreal Canadiens. The team of destiny fashioned the most remarkable spring in their incomparable playoff history, on the shoulders of their extraordinary goaltender, Patrick Roy. With an illegal stick and a memorable wink, Montreal captured Canada's last Stanley Cup to date. We have come to expect great things from Todd Denault. His trademark extensive research and more than one-hundred interviews expertly chronicles one of the truly landmark seasons in NHL history. It's hard to believe it's already been 20 years since all that happened. Denault brings it all back to life and makes you think it all happened just last week. It truly was a remarkable season. And this truly is a remarkable book.